Hormone disruptors, toxins, carcinogens, preservatives in many popular sunscreens can negatively impact people, corals, aquatic and marine life. In 2018, Hawai’i passed a ban on sunscreens containing oxybenzone and octinoxate – two of the more dangerous ingredients – which goes into effect in 2021. Still stores continue to sell them. Many brands that removed these two chemicals from some of their formulations now label them as “reef safe” as if simply not containing oxybenzone and octinoxate automatically equate to a product being safe. There are no regulations on the term “reef safe”, “coral safe” or “safe” in general. In fact there are many questionable active and inactive ingredients commonly used. Some we try to avoid include: oxybenzone, homosalate, octisalate, octinoxate, octocrylene, avobenzone, dimethicone, parabens, BHT, nanoparticles, propylene glycol, synthetic fragrances, retinyl palmitate, cocamide dea, phenoxyethanol. Always check the bottle. We look for sunscreens that are safer for people and the environment. When choosing a sunscreen we like broad spectrum protection from minerals such as non-nano zinc oxide (or titanium dioxide) in a natural base. See our PDF for a few to try. Feel free to print and share with your local shop buyer or at your next sunscreen trade-in. 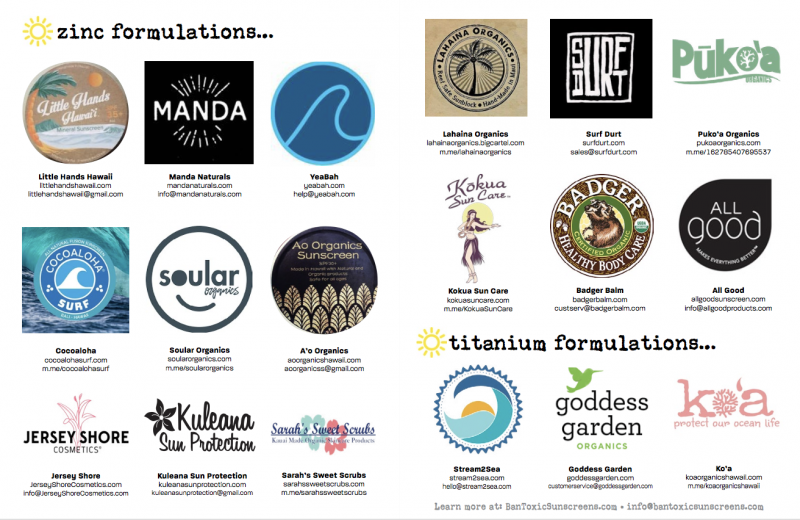 Aloha, and thank you for sharing all these awesome reef safe sunscreen. Just wanted to introduce you to one more, my personal favorite – Poofy Organics. I´m attaching a link. Let me know what you think! Thank you for your dedication and diligence! I’m currently using Neutrogena oil free moisturizer. Every ingredient in it is on your banned list! Oh no (re: Nutrogena!!!). We’re going to have a new Safe Sunscreen Box coming out soon – they’re a really fun way to try out safer mineral brands (and this next one features brands that utilize CACAO (from cocoa butter to cocoa powder, so should be YUM!) 🙂 We’ll also have our big Summer Box in May. Check our sister site sunscreensafe.com in the SHOP area you can see our last box to get an idea. Follow us on Instagram or Facebook you’ll see when it’s available. Or sign up to our mailing list so you get a notice. Our goal is bringing awareness and helping people transition to sunscreens safer for people and the environment. There’s lots of great options these days. Would you believe I am allergic to zinc oxide, get a nasty blistering rash, all the other nasty ingredients have never given noticeable reactions! Bummer, eh? Hi Polly. Sorry to hear! That’s why we also include sunscreens with titanium dioxide as the active ingredient. Often though, we discover many who thought they were allergic to zinc were actually allergic to a coating added to zinc. Coatings can include dimethicone, silica or aluminum – and it’s usually the aluminum. Also some zinc comes from China and can be contaminated with heavy metals. It’s good to check with companies regarding where they get their zinc, if it’s nano particle (request the results of testing on the particle size) and if it’s coated and with what. If you’ve already gotten an allergy skin test and are certain it’s the zinc oxide we’d suggest trying titanium (and again check on the coatings and do a skin patch test first). Good luck! Please check out my research in my books that show that zinc or titanium oxides are not the answer, as they kill the phytoplankton, the bottom of the food chain. They also damage our children’s brain development. Would love to talk with you: 949-551-3397 in Pacific time zone.